What would The Colbert Report be without gimmicks? When Stephen Colbert isn't teaming up with Ben & Jerry's, he's trying to run for president. When he's not faux-feuding with billionaire attention hog Richard Branson, he's campaigning to get a slang term he coined included in the dictionary. Now, the latest in his long string of (essentially harmless) promotional stunts sees him harnessing the tremendous power of the Colbert Nation in an attempt to humble the latest convert to Auto-Tune, Mr. Kanye West. You see, Colbert apparently isn't too pleased that his new Christmas album, A Colbert Christmas: The Greatest Gift of All!, is sitting at No. 16 on the iTunes Album Charts. Thus, he has demanded that his disciples flood the iTunes Music Store at 5 p.m. EST this afternoon to purchase the LP, thereby dethroning Kanye's 808s and Heartbreak. How would the notoriously egomaniacal image-conscious Kanye respond? Well, just like thousands of other technologically savvy young folks with something to say (and egos that need stroking), Kanye Twittered his response: "who the f*** is Stephen Colbert?" [Ed. note: Still 107 characters to spare!]. Now this isn't the first time that Kanye has found himself embroiled in a pseudo beef around the time of a record release &#8212; he famously entered into a mutually beneficial showdown with 50 Cent when both released their LPs on September 11, 2007. However, this latest situation finds Kanye playing the unfamiliar role of possum, as he's pretending that he doesn't know who Stephen Colbert is. But why? The simple answer is that it's in each other's best interests to stoke a friendly (albeit pretend) rivalry. 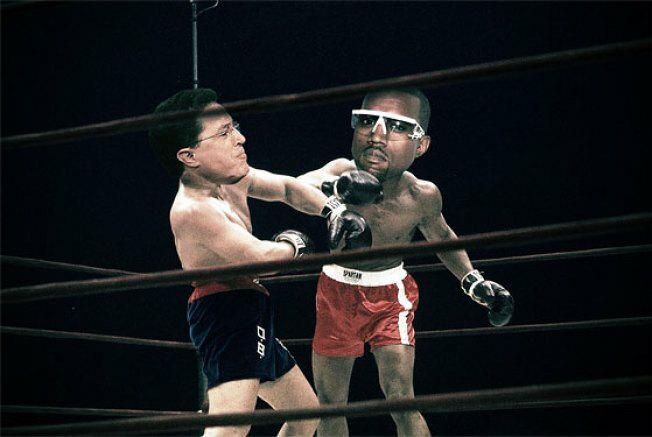 Colbert gets to put another notch on his ever-expanding gimmick belt, and Kanye will likely find himself with an opportunity to appear on a popular talk show where he can expound (let's hope sans Auto-Tune) upon important subjects other than 808s and heartbreak. Somehow, we think that these two famously outspoken cultural icons just might find that they have more in common than the ever-increasing size of their wallets.